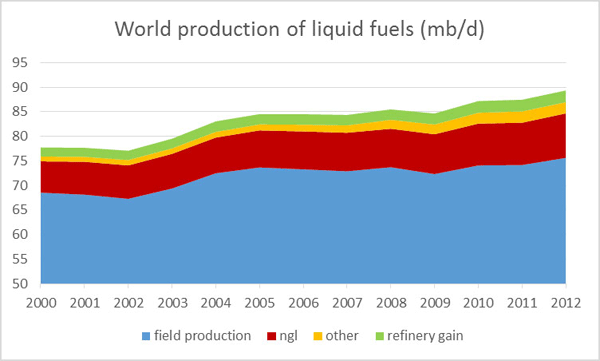 Annual world production of liquid fuels (in millions of barrels per day), 2000-2012. Blue: production of crude oil including lease condensate; brick: natural gas plant liquids; green: refinery processing gain; orange: other liquids (chiefly biofuels). Data source: EIA. 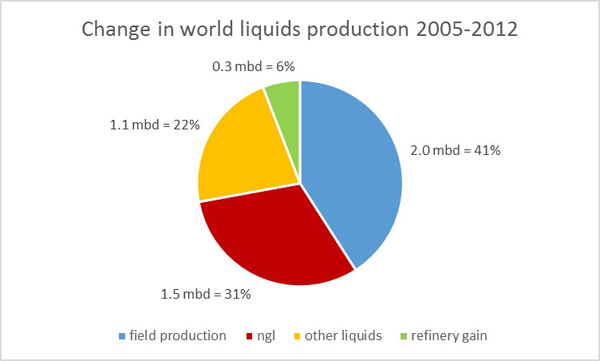 Change in annual world production of liquid fuels (in millions of barrels per day) between 2005 and 2012. Blue: production of crude oil including lease condensate; brick: natural gas plant liquids; green: refinery processing gain; orange: other liquids (chiefly biofuels). Data source: EIA. It’s also interesting to look at where the growth in field production came from. U.S. production grew by 1.3 mb/d and Canada by 770,000 b/d. Between them, these two countries could account for more than 100% of the 2.0 mb/d increase in world crude oil production since 2005, Production from all of the other countries in the world combined actually fell a little between 2005 and 2012. Significant gains in places like Iraq, Russia, and Angola were more than offset by declines in the North Sea, Mexico, and Iran. 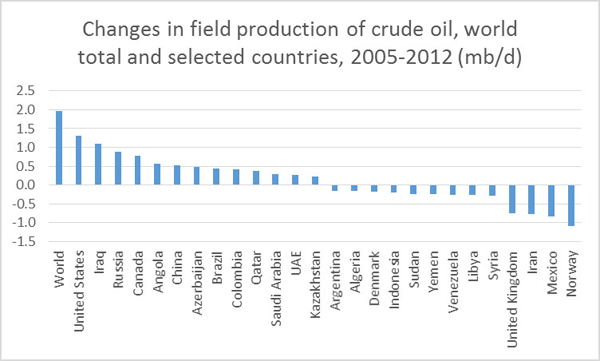 Change in annual world production of crude oil and liquid condensate (in millions of barrels per day) between 2005 and 2012 for selected countries. Data source: EIA. Within the United States, more than all of that 1.3 mb/d increase could be attributed to production of oil from tight formations, which the EIA estimates accounted for 2.0 mb/d of total U.S. oil production in 2012. And within Canada, more than all of that 770,000 mb/d increase could be attributed to production of liquids from oil sands, which the National Energy Board estimates increased by 830,000 b/d between 2005 and 2012. In other words, without oil sands and tight oil, crude oil production in the United States and Canada, and for that matter the world as a whole, would have been lower in 2012 than it was in 2005. The EIA anticipates that U.S. tight oil production can continue to increase another 800,000 b/d above 2012 levels before peaking in 2020. It’s interesting to put these numbers in the perspective of the entire history of production from America’s bountiful supplies. The surge over the last two years is unprecedented. Even so, the levels for the first half of 2013 remain 2.5 mb/d below the peak of 1970. If the EIA projections above are correct, none of this is going to change the fact that U.S. production peaked 40 years ago. Instead, tight oil will give a dramatic but temporary bump back up in a longer trajectory of decline, similar to that provided by new production from Alaska in the mid 1980s. 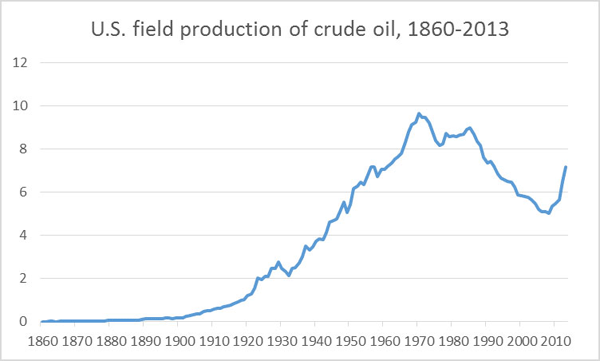 U.S. production of crude oil and condensate (in million b/d), 1860-2013. Last entry is estimate based on first 6 months of 2013. Data source: EIA. The new higher oil / energy prices are here to stay but I believe they will stay range-bound in $100 to $150 / bbl bracket, perhaps for decades as we munch our way through the $125±25 slab of resource. As I write, Libya, Tunisia, Egypt, Syria, Lebanon, Iraq, and Iran are all subject to varying degrees of economic and political turmoil…. I assume at some point a large oil producer will descend into turmoil and then there will be a large price spike, and that may kick the global oil market out of the current meta-stable state. To which I would further add, a major economic downturn in China would send the price of oil plunging back down. World oil production has not moved significantly since 2005 to present, it hovers around 75 million barrels a day. The other gains are only 15% of total and although they are the unconventional fuels that drive world growth, they are more expensive to produce. Oil has peaked. Unconventional oils are increasing but when conventional oil begins to decline within 2 years, all bets are off. Excellent article. Figure 97 is particularly interesting. It shows tight oil (a.k.a shale oil) peaking at 2.75 million barrels a day in 2020 and then declining thereafter. 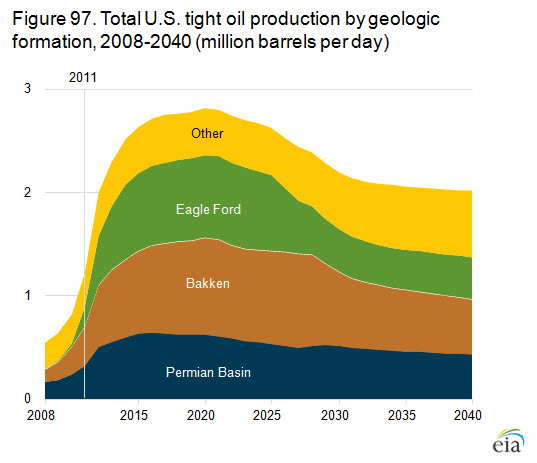 Than why all this media hype on shale oil ” saving the US, US being self-sufficient in oil etc” ? According to the 2013 BP World Energy report, US average production in 2012 was 8.6 million barrels oil a day( mbd), including shale. The US consumes 18.6 mbd and hence imported 10.6 mbd in 2012. So, unless somebody has some magic calculator, I do not see this “self sufficiency” ever happening. We are screwed ! And we have to keep importing forever. Simple 4th grade arithmetic! According to the 2013 BP report and 2013 EIA world shale assessment, the US has 35 billion barrels(BB) of conventional oil reserves and 58 BB of shale oil reserves., Making a total of 93BB. At our consumption rate of 18.6 mbd, we will be done in just 13.7 years. Again 4th grade arithmetic! And the world in total has 2014 BB of reserves ( 1669 BB conventional and 345 BB of shale), daily consumption is 89.6 mbd, hence world oil life is just 61 years , not much longer than when I left high school 52 years ago! So the world will be pretty screwed too pretty soon unless we come up with renewable energy miracles to make up the colossal 30% of world energy that is oil today. Impending Armageddon? If any prophet out there has a better theory, I would like to hear of it. Facts and figure please, not political gamesmanship and plain lying!